89% of the time, my answer is QuickBooks Online. It integrates so nicely with your bank feeds (even PayPal) that it makes doing your bookkeeping so easy. Which version of QuickBooks Online do I need? At a minimum you need the Essentials level. If you have a number of different programs/products/services that you are selling and you want to track the profitability of them individually as I recommend, you will need the Plus version to do that. Who is not a good fit for QB Online? 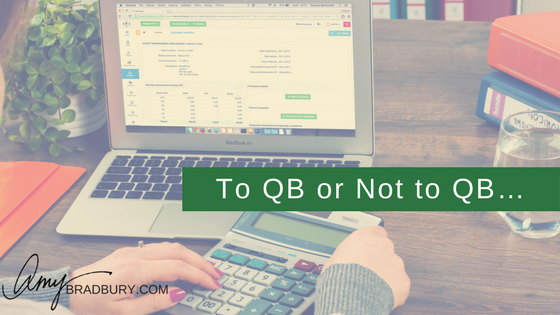 Everyone should be purchasing QuickBooks Online…but there are a few cases where it’s not the right fit. *Contractors/Manufacturing/Inventory holding type companies – QuickBooks is still a good option, but the desktop version better than Online, it’s more robust for their particular needs. *If you need multi-currency, or are Canadian then Xero is a great alternative to QB. Usual offers will give you a discount from the first year, but then it goes back to reg price. Do you offer 1 hour sessions. I am an info-preneur and just have a fe quick questions about how to use Quickbooks and properly keep track of my business finances.